G^(uiNa + u2Nb + u3N3)(2ß—sin 2/?) (16-97f) Note that the angle ß must be expressed in radians in these equations. The variation-of-parameters method will be most useful if |N|/«|L|. In this case, Eqs. (16-95) and (16-96) can be integrated with a large time step to find q^t) and LoO). 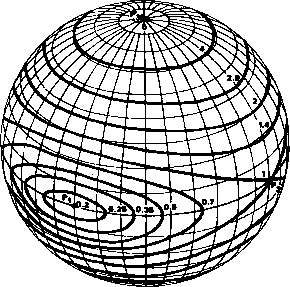 The Euler symmetric parameters, q(t), representing the attitude at time /, can then be obtained from Eqs. (16-86) and (16-87); the angular momentum vector L(/), can be found from Eq. (16-94), if desired. Equation (16-95) has the same structure as the kinematic equation of motion for the instantaneous Euler symmetric parameters, Eq. (16-3), so any techniques used for solving the latter equation can also be used for the former. In particular, the closed-form solution of Eq. (16-4), which is discussed in Section 17.1, is applicable if the direction of <b does not change during the time step. The above variation-of-parameters equations were derived from rigid body dynamics and therefore are most useful for single-spin spacecraft. Effects of reaction wheels can be added as perturbations, but the resulting equations are most useful if the deviations from the unperturbed motion are small. In particular, any spacecraft nutation (with nutation angle less than 90 deg) is modeled exactly and much more efficiently by the variation-of-parameters method than by a straightforward numerical integration of Euler's equations. The variation-of-parameters equations for the asymmetric case, 7, + I2, have been studied by Kraige and Junkins , They are significantly more complicated than the equations for the axial symmetry case, largely because of the dependence of the parameter, m, of the Jacobian elliptic functions on the initial values of L and q. In principle, the closed-form solution (Eq. (16-69)) to Euler's equations for torque-free rigid-body motion could be used to determine spacecraft dynamic motion from telemetered attitude sensor data. In practice, this is normally impossible because initial values of the Euler angles and an accurate knowledge of spacecraft rotational kinetic energy and angular momentum magnitude are unavailable. This section discusses some simplifying assumptions which reduce the complexity of the original equations, thus permitting approximate solutions for the spacecraft motion based on attitude sensor data. Throughout this section we assume that the spacecraft is undergoing rigid-body, torque-free motion, that the moments of inertia are known, and that the nutation angle, 9, is small. The inertia] frame ()f, Y, Z) is defined to have its Z axis collinear with the angular momentum vector, L. The body frame (x, y, z) will be the principal axes. Without loss of generality, we take the body z axis to be the nominal spin axis; the 3-1-3 Euler rotation sequence (<t>,0,\p) defined in Eq. (12-20) will be used to transform vectors from the inertia! to the body frame. Thus, the angle measured by the sensor oscillates with the inertial nutation rate, w, (=<f>). Examples of such sensors include magnetometers aligned with the body z axis or star sensors which measure the coelevation of stars.